First released in the Apple App Store December 2016, the Agile Autoguider is an iPhone app that corrects the mechanical guiding of your telescope to achieve high guiding precision. The iPhone is attached to the finder scope of your telescope and tracks a guide star via the rear camera. If the guide star drifts, an actuation is computed to bring the telescope back to position. Continuous corrections enable you to take long-exposure photos with dot-shape stars or to train the periodic- error correction of your telescope mount. The program supports autoguiding via WiFi adapter and manual guiding with on-screen instructions. The setup is straightforward – attach the iPhone to your finderscope, calibrate, and start guiding. You’ll need an adapter to attach your iPhone (running iOS 8.0 or later) to your scope. The app offers a wide range of settings with comprehensible descriptions for optimal guiding performance. The app provides two kinds of guiding: manual and automatic. When guiding manually, the app tracks the guide star and gives you advice on how to move the telescope to keep the guide star in position. When guiding automatically, the app is connected directly to your mount. If the guide star deviates from its position, the app controls the mount so that the star appears at the original position again. 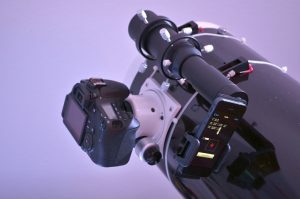 typical setup, shown in the accompanying image, consists of a finder scope with T2 connection, an adapter for eyepiece photography with inserted wide-angle (25-mm) eyepiece, a T2 extender; a smartphone-to-T2 adapter, an iPhone 5 communicating to a SkyFi Wireless Telescope Controller and a DSLR in focuser of telescope. Adding a 90-degree angle prism makes interaction with the smartphone more convenient, especially if you use a Newtonian telescope. The app is the brainchild of Malte Weiss, PhD. You can learn more at www.malteweiss.de/agileautoguider/ .